All things Collie: Kibble chat with the collies - What makes a good dog food good? Kibble chat with the collies - What makes a good dog food good? Have you ever spent time researching dog or cat food, trying to make the best choice possible for your best friend? There are so many companies, and so many varieties that the process can be very confusing for the average pet owner. Trying to determine what you want, and more importantly what you don’t want, in your pet food is a Herculean task of epic proportions. There are websites that rank the pet foods available, and many do the research for you. But even those are influenced by the people writing and maintaining the websites, so I wouldn't recommend relying completely on their opinions. I would never tell anyone what they should feed their dog or cat, as there are just too many factors to consider. Allergies, age of the animal, location, financial cost, and even the activity levels of the pets all need to be considered. I know it all has my head spinning, so I’m sure many of you feel the same way. We prefer a kibble with No fish or potatoes. No fish, because some fish is preserved with ethoxyquin. No potatoes because a couple of the collies have allergies to potatoes/sweet potatoes. The food should be Free from artificial preservatives, flavors and colors. The food should contain No ingredients from China or Thailand, because there is just too much risk. No sodium selenite, as this is linked to toxicity in dogs and cats. It is safer to use Selenium yeast. No Carrageenan, as this is linked to gastrointestinal disease and gastric cancer. In producing the food, we want a food that is not irradiated. While irradiation may kill dangerous bacteria, chemical alterations to the food can occur and the process destroys valuable nutrients. The meat should be sourced from humanely raised animals. We do not want to see animal fat, animal digest, meat by-products, bone meal or meat meal, as any of these can be sourced from dead, diseased, non-slaughtered or even euthanized animals. We have not yet succeeded in finding a dog food that meets all of our requirements, so we concentrate on finding the food that comes closest. 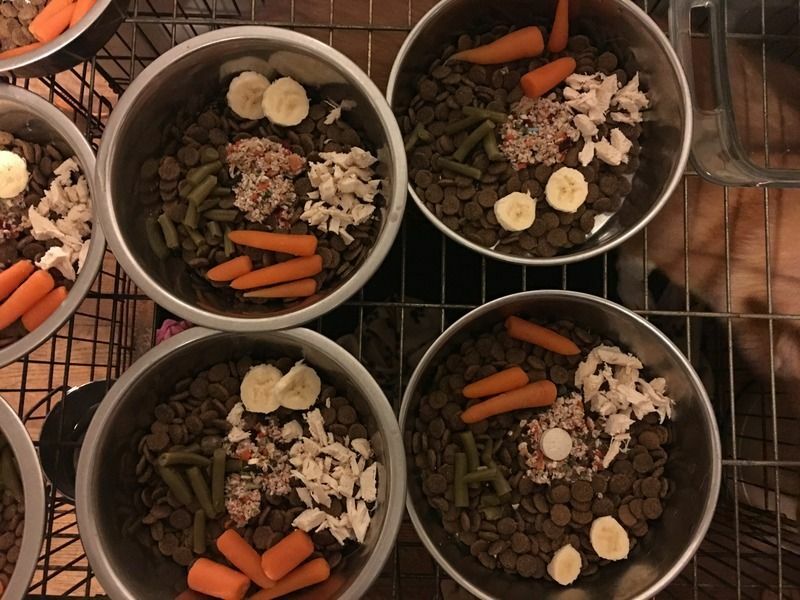 I have also begun cooking for my dogs, and replacing about a ¼ of their kibble with real homemade food a few nights a week. This accomplishes two things, one it gives my dogs a variety of different foods so they are not stuck eating the same food day after day. (Can you imagine eating a bowl of cereal three times a day for the rest of your life? Does that sound appealing?) And two, it enables me to make sure they are getting good nutrition, without relying solely on a kibble produced by a Pet Food company/corporation. Plus, the collies love it, they line up, drooling in anticipation of whatever meat, fruit and veggies I have added to their food that night. So we are curious, have you found a food that meets all of your requirements? Or are you still searching for that perfect food? Are there things that you are looking for in a food, or things you are looking to avoid, that we haven't included on our list? So what would you rate as the top must haves or have nots in your dog's kibble? I never knew what meat meal was. That is disgusting and scary. Thank you so much for sharing. Yumm!! I like supplementing our dogs food with freeze dried food as a topper on their kibbles, or coconut oil/fish oil. We stick to either American or Canadian brands, grain free, no corn/wheat/soy, no artificial colors or ingredients, no byproducts. We like limited ingredients where I know what each ingredient is. No chicken, and no beef. We also like to rotate foods every other month or so. If I find a flavor that they go nuts over then we might keep it a little longer. But usually I'll switch either same brand different protein, or same protein different brand. Dante and Ziva aren't food hounds and will skip meals if they aren't hungry so I try to keep things fun and new for them. I too have spent hours reading up on dog food ingredients. Thanks for this list. The point about fish is new to me. I agree it is hard to find a kibble that checks off every item!